Dr. Heidi Hottinger received her doctor of veterinary medicine degree from The Ohio State University School of Veterinary Medicine in 1990. Following veterinary school, she pursued an internship in small animal medicine and surgery at the Animal Medical Center in New York City. She then completed a residency in small animal surgery at Michigan State University and became board certified by the American College of Veterinary Surgeons in 1996. Following her residency, Dr. Hottinger returned to the Animal Medical Center in New York City to join the clinical faculty and staff in soft tissue surgery. 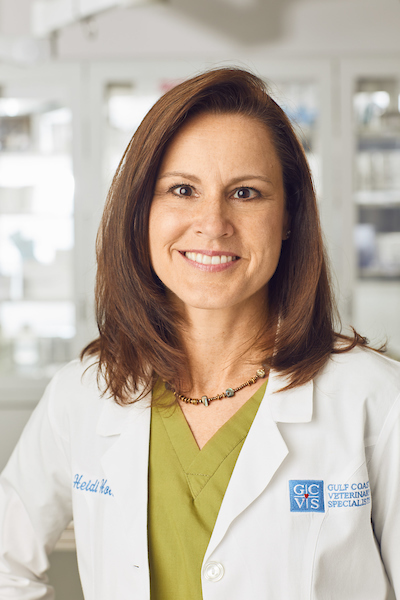 She moved to Houston in 1996 to practice soft tissue and oncologic surgery at Gulf Coast Veterinary Specialists, where she is currently one of the medical directors. Dr. Hottinger was instrumental in developing the highly regarded surgical internship training program at Gulf Coast Veterinary Specialists, and continues to serve as a program director and mentor for the internship. In addition to teaching our surgical interns, Dr. Hottinger participates in the teaching and training of veterinarians and veterinary students who visit our hospital. She also lectures on both the national and international stage, and was awarded the Small Animal Instructor of the Year by the WVC in 2013. She has authored and co-authored numerous scientific papers in veterinary literature to help advance the field of veterinary medicine. In her free time, Dr. Hottinger enjoys spending time with her husband, Mike, and their two whippets, Luna and Reed. She also enjoys gardening, jumping horses, and cycling. Dr. Hottinger made me feel 100x more comfortable regarding Lucy's future outlook. Her knowledge and experience with the type of cancer in Italian Greyhounds left me feeling extremely comfortable leaving Lucy in her capable hands. She was also extremely warm and welcoming.